If your School has the Team Sheet Builder module then all SOCS sports account holders are able to synchronize the entire school's sports programme for the current and following school years to their personal Outlook or iPad calendars, or to any 3rd party calendar programme that accepts an iCal feed. Step 1. 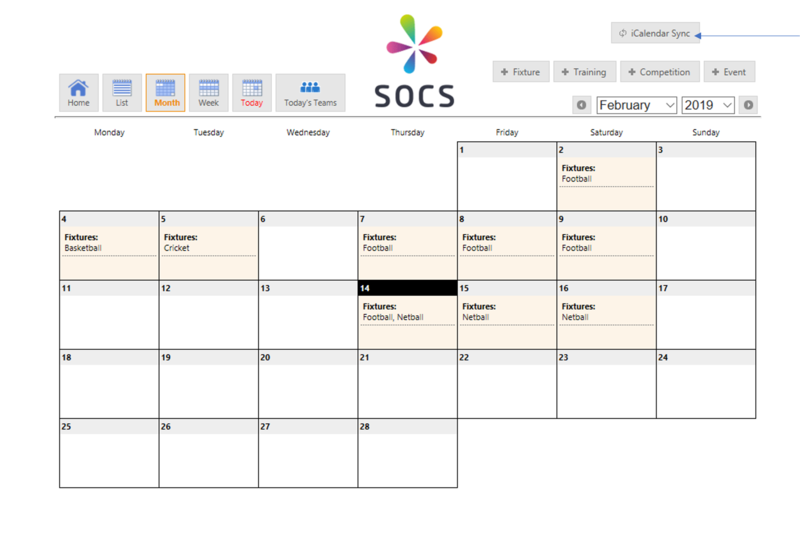 Login to your SOCS control panel from your PC or mobile device which has your Calendar. Step 2. From the main menu navigate to the Calendar. Step 3. From the Calendar, click the iCal Synch button, which is located at the top of the calendar as illustrated below, and then follow the instructions. 1. You need only setup the synch feed once for any changes made via SOCS to be synchronized with your personal calendar when connected to the Internet. 2. If no return time has been specified for away fixtures then these are synchronised with a duration of 4 hours. For Home fixtures the duration is set to 2 hours. NB. For all fixtures, both home and away, it is recommended that a team's return time is specified so that your personal calendar is accurate.